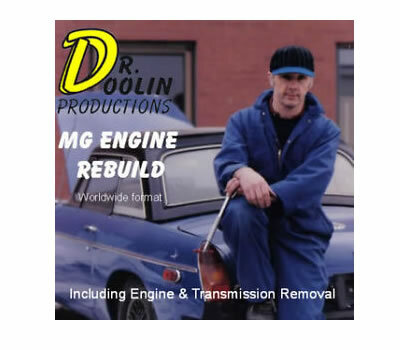 Dr Doolin's MGB Engine Rebuild video. Many copies have been sold of this video, it has successfully enabled scores of D.I.Y. fans to remove and rebuild their MGB engine. The savings on labour cost alone is far more than the cost of the DVD. As you are working with the DVD, please feel free to E-mail Dr-Doolin for help with any questions or problems you are experiencing with your project. "Dr Doolin" who's name is actually James Doolin has been in the automotive trade for over forty years. He holds both Auto mechanic and Body / Collision repair license. Has taught both adult interest classes and Automotive and Body apprentice courses at local colleges. This DVD is from James Doolin himself and was produced in 1993. The DVD was copied from our original Super VHS Tape & was quite expensive to produce at that time. Therefore, the picture quality is not up to today's standards. We hope to update this DVD in the near future as the filming and editing costs have decreased considerably. Please view the DVD on a computer or small screen TV not on a large screen or with HD. The DVD is compatible with systems worldwide.